Facebook offers users dozens of options for choosing and presenting gender identity on the social network, but those options aren't so easy to find. People typically choose a gender when they first sign up and fill out their personal information in the profile area of their Timeline page. For a long time, the gender options were limited to male or female, so most users already have one or the other set. Some people might want to edit that option in the wake of Facebook's decision to make other gender identities available to users of the sprawling social network. Facebook rolled out some 50 different gender options in February 2014 after working with advocates from LGBTQ groups in an attempt to make the site more friendly to people who don't identify as simply male or female. 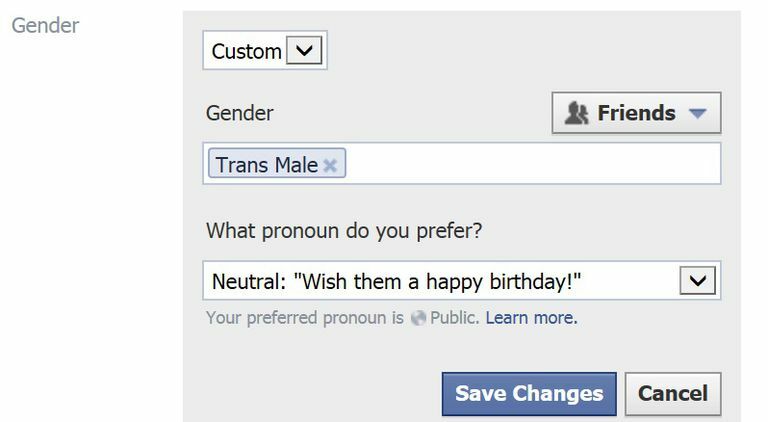 Not only can users choose to identify their gender from categories, such as "bigender" or "gender fluid," but Facebook also lets everyone decide which pronouns they'd like to be associated with whatever gender option they choose. The options are limited, though. It's either female, male or what Facebook calls "neutral," and amounts to the third person plural as in "them." Facebook said in a blog post that it had worked with Network of Support, a group of LGBTQ advocacy organizations, to develop the custom gender options. To access the new gender options, visit your Timeline page and look for the "About" or "Update Info" link under your profile picture. Either link should take you to the profile area full of information about you, including your education, family, and, yes, gender. Scroll down to find the "Basic Information" box which contains gender information along with marital status and your birth date. If you can't find the "Basic Information" box, look for the "About You" box and click the "More" link to find more categories of additional details about you. Eventually, you'll find the "Basic Information" box. It will either list the gender identity you previously selected or if you never selected any, it may say, "Add Gender." Either click "Add Gender" if you're adding it for the first time, or the "Edit" button at the right if you want to change your previously selected gender. No list of gender options will appear automatically. You have to have an idea of what you're looking for and type the first few letters of the word into the search box, then available gender options matching those letters will appear in a drop-down menu. Type "trans" for example and "Trans Female" and "Trans Male" will pop up, among other options. Type "a" and you should see "androgynous" pop up. Click the gender option you want to select, then click "save." Facebook allows you to use its audience selector function to limit who can see your gender selection. You don't have to let all of your friends see it. You can use Facebook's custom friends list function to specify who can see it, then select that list using the audience selector function. It's the same thing you can do for particular status updates -- specify who can see it by selecting a list.